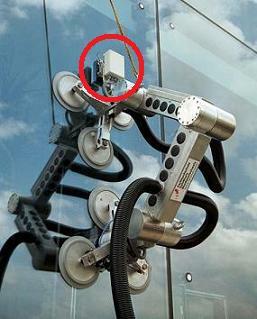 Behold the Gekko, window washing robot of the future. It fears no wind. Dubai’s endless streets of skyscrapers require an army of window washers. A Swiss company is hoping to replace that human workforce with a robotic one. Serbot AG has two high speed surface cleaning robots designed to work quicker than humans and in wind conditions no sane person would dare. The Gekko looks like a tank with suction cup treads and the Clean Ant has this weird set of legs that pivots and flips in crazy ways. These two bots are set to revolutionize Dubai’s massive building cleaning industry. 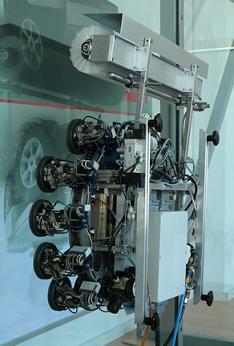 If they can succeed in that glass jungle, Serbot AG could bring their cleaning bots to the rest of the world. Watch out window washers, the machines are coming for your jobs and they fear no wind. Check out all the crazy scrubbing action in the videos below. The Gekko and Clean Ant aren’t just faster than humans, they’re a lot faster. A professional washer could probably manage 20 to 30 square meters per hour. The Clean Ant can work on all sorts of curved surfaces and corners and still manage 150. Gekko, which is used on flat surfaces, has a blazing top speed near 360! These bots can do the work of 5 or 10 human workers. And their cleaning supplies get pumped right through them – they’re completely self contained. You don’t even have to install tracks. To give you some idea of what these robots are replacing I included a look at their competition. Washers cleaning the Dubai airport. The Gekko and Clean Ant are pretty impressive bots, but they are just one of the many examples of how automation is going to remove humans from the workforce. It’s not just labor jobs that will be affected. We’ve already seen how software could replace some scientists and journalists. This isn’t necessarily a bad thing. Though some worry automation could lead to economic collapse, it could also free humans to pursue other tasks, to become entrepreneurs or artists. No matter what the possible consequences, it’s hard to doubt that robots are going to occupy more jobs. Look at the Serbot AG bots: fast, versatile, self contained, and they’ll never get dizzy or fall to their deaths. If this is our competition, we humans don’t stand a chance. Confused about which part of the Clean Ant actually cleans? The box in the red circle has a brush and can spray dry ice or special water to wash without soap.